This event was held at the Kenyatta University Conference Centre (KUCC). The participants comprised of project team members and relevant stakeholders from the agricultural and education sector. The aim of the meeting was to take stock of the achievements of the project, disseminate the project outcomes, enhance the visibility of the project to the wider public and implement the exit strategy for the project. In attendance were the Vice Chancellors of Kenyatta University (represented by Prof J. Okumu, the DVC academic) and Prof Charles Olweny, the Vice Chancellor of Uganda Martyr’s University. The Kenyatta University Vice Chancellor opened the meeting while the Vice Chancellor of UMU gave the key note address and closing remarks. This training course was facilitated by Dr Phil Hollington, CARIAD, Bangor University. Eighteen participants took part in activities to delelop their skills in: project planning, project cycle management, logical frameworks, proposal development. New proposals were developed for a current call. Ten participants from UMU, MMUST and KU were given 'hands-on' training in moleclar techniques for plant breeding, including DNA extraction, PCR and analysis of different types of molecular markers. The experienced faclilitators were Dr. Alice N. Muchugi and Dr. Steven M. Runo. "I really appreciated the opportunity and thank my supervisors both in Kenya and at Bangor for being keen on me and helping me through the training as I did my masters project. I thank Dr. Katherine Steele for the opportunity to work in her Barley for food project and present part of it as my masters thesis in my graduating university (Kenyatta)." 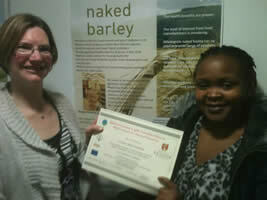 Caroline Kambona has started a three month research project at Bangor University, UK, where she will learn molecular breeding techniques for crops. She is in her second year of a masters degree at Kenyatta University, Kenya. How many figures or tables to include? What should be contained in the abstract? Two courses were led by Dr K.D. Joshi (Bangor University), who has a wealth of experience in running participatory plant breeding programmes in Nepal and Bangladesh. His work has led to the uptake and release of new varieties of rice, maize and legumes in Asia. This first-hand experience has now been shared with scientists and policy makers in Kenya and Uganda during workshops in each country. The course hosted by UMU was held between 11 – 18 June in Kampala. The course hosted by Kenyatta University was held between 22 – 30 June. Both courses generated a lot of interest. The interaction with farmers during the two day field work was a great eye opener for the participants. A training workshop molecular markers was recently held at the BecA Platform at ILRI (Nairobi, Kenya). The participants found the course informative and of relevance to their work. The project leaders of CAPACITATE East Africa wish to thank ICRISAT for organising the workshop. Bangor University hosted a successful project meeting with participants attending in person from all 4 partner universities and a Skype meeting with our associates at BecA and ICRISAT. The project team welcomed the two new co-ordinators from UMU and Kenyatta University, while we look forward to contiuing to work on the project with those who have stepped down from these roles. A full programme of courses and visits is planned for the coming few months and we look forward to welcoming all participants to these events. For further details please join the group CAPACITATE members on LINKEDIN.com. A presentation of the molecular marker work on pumpkin presented by our current visitor to Bangor. Participants are all welcomed to MMUST, Kakamega, Kenya! Douglas Mutebi and Maryrose Kithinji from Uganda and Kenya respectively are visiting Bangor University, UK, for 6 months training in molecular biology. Prof. John Witcombe (Bangor University) is leading two workshops this month to transfer COB technology, one in Uganda and one in Kenya. A networking workshop for project participants is being held in Kampala. Organised by Dr Charles Ssekywa from UMU and Dr Philip Hollington from Bangor University, it will provide support and resources to participants in networking. In particular, it will target identified weaknesses in networking and network management such as reporting delays, financial irregularities, and low motivation of team members. This meeting took place in Masaka, Uganda. Information on existing constraints and current gaps in the development and delivery of new varieties adapted to region was collated. The role of indigenous knowledge and biodiversity in breeding for adaptation to climate change and disease resistance was outlined and action plans were implemented. This information will inform the project activities.